Hello, and thank you for stopping by. 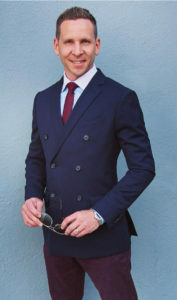 My name is Nicholas Lucin and I am the face behind BestGentleman.com. I am also the face behind many of the Award Winning news channels you see across the United States. Graphics, Design, Animation, and Production are all elements of my background and training, but Leadership is my specialty. I moved to Los Angeles 12 years ago with empty pockets and a heart filled with passion. I had never been to the city, although I knew deep within it was where I needed to be. So, I left my old life behind and never looked back. I made a career out of photographing, interviewing, and working alongside: movie stars, musicians, models, sports stars, etc. My offices have stretched from 30 Rock in NYC to Los Angeles Movie Lots. I don’t do work for awards, but the EMMY and Promax Awards are a fun talking points at home. An avid traveler, I journey across this great world regularly. My next adventure is always just around the corner. I have been to the Bamboo forests of Hawaii to the crystal water beaches of Croatia, and far beyond. Where to next? Follow my adventures on the blog and social media. BestGentleman.com is a resource of information coming to you from a man of humble beginnings. I reference my life of travel, adventure, and rich cultural experiences as inspiration for my posts.